Stephen F. Austin State University students recently won the American Society for Biochemistry and Molecular Biology's national T-shirt design contest. T-shirts with the design will be sold at the society's annual meeting. From left: Javier Castaneda, sophomore chemistry major; Jenny Beldin, biochemistry graduate; Luanna Saade, senior biochemistry major; Carmel Tovar, senior biochemistry major; and Logan Sheffield, senior biology major. NACOGDOCHES, Texas - Scientists and science students from universities across the nation will soon be wearing T-shirts designed by Lumberjacks. Stephen F. Austin State University students won the American Society for Biochemistry and Molecular Biology's national T-shirt design contest. T-shirts with the design will be sold at the society's 2018 annual Experimental Biology meeting in San Diego in April. "It is a great honor for our chapter to be receiving this award, especially after all of the hard work that was put into the design," said Logan Sheffield, SFA ASBMB chapter president and senior biology major from Angleton, Texas. "It was exciting to see that we were able to compete with the other universities, some of which are much larger than SFA." Volunteering in various on-campus events, chapter members are active participants in STEM Academy, Girl Scout STEM Day and High School STEM Day. Off campus, members volunteer at Nacogdoches Memorial Hospital, participate in the annual Undergraduate Research Conference hosted by the School of Honors and present research at events such as the ASBMB conference. 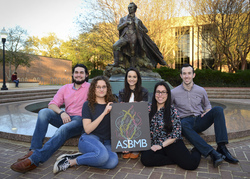 "The ASBMB SFA student chapter focuses on expanding the knowledge of biochemistry and molecular biology to undergraduate and graduate students," said Carmel Tovar, chapter secretary and senior biochemistry major from San Antonio. The chapter also seeks to inspire prospective students by participating in university-supported programs for high school students, Tovar said. "By mentoring future generations, the idea of pursuing higher education, especially in the STEM field, becomes more of a reality than a dream," Tovar said. Not just an organization for STEM majors, the chapter is open to anyone wanting to get involved, Sheffield said. "I believe our ASBMB chapter is a great organization to join for any student who is interested in biomedical sciences, as well as those that just wish to build their résumé by getting involved on campus," Sheffield said. For more information about the chapter, contact Dr. Tayo Odunuga, faculty adviser and associate professor in the Department of Chemistry and Biochemistry, at odunugaoo@sfasu.edu.